This recycling guide was produced in 2011 and some of the information is now out of date. We will be updating this guide in the near future but for now we recommend you download the 2018 edition of The Beginner's Guide to Recycling which contains more up-to-date information on recycling. The guide is free to download. Where to take your recyclables? By buying products made from recycled material you are supporting the recycling industry. 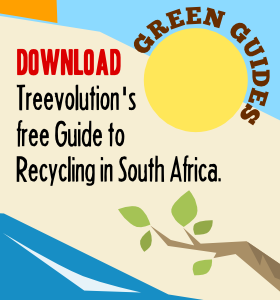 To make things easier for you, Treevolution has started a list of recycled products available in South Africa. Roof insulation helps keep buildings cooler in summer and warmer in winter, helping you to save on the energy needed for heating and cooling. Isotherm is made by South African company Brits Woven from recycled green-coloured PET (number 1 plastics), so by using it you’re not only supporting the local PET recycling industry, you’re also saving energy. Isotherm is non-flammable, you don’t need protective clothing to install it, and it is itself 100-percent recyclable. You can also use Isotherm as a geyser blanket, see Isotherm’s website for more information.